The Manhattan College Jaspers Men’s Soccer Summer ID Camp is going to run from 12 noon until 5 o’clock in the afternoon on the 4th of August. It is open to all male high school soccer players who are looking to take their game to the next level. It is the ideal venue for those who wanted to experience a Division I like training environment. In addition, this soccer identification camp will be under the direction of the Manhattan College Jaspers men’s soccer coaching staff. It is going to take place at the scenic Manhattan College campus in Bronx, New York. The camp registration fee is $99 per player. Manhattan College, initially the Academy of the Holy Infancy, is a private, coeducational, Roman Catholic, liberal arts college in The Bronx, New York. Its founder is the De La Salle Christian Brothers, a Roman Catholic congregation. Furthermore, the Manhattan College is an affiliation of the Association of Catholic Colleges and Universities and the Consortium of Liberal Arts Colleges. Manhattan College is a member of the National Association of Independent Colleges and Universities. It is also part of the Annapolis Group and the Oberlin Group. Currently, Manhattan College’s undergraduate student population is 3,637. This undergraduate student population is through a selective enrollment acceptance rate of 71 percent. 55 percent of this undergraduate student population are male students and 45 percent are female students. The college’s student to faculty ratio is 13:1. Moreover, in the 2018 edition of the US News and World Reports Best Colleges rankings, Manhattan College is 15th in Regional Universities North category. It is also 6th in the Best Colleges for Veterans category and 381st in the Business Programs category. In sports, the college is competing in the National Collegiate Athletic Association Division I, Metro Atlantic Athletic Conference as the Jaspers and Lady Jaspers. Their identity colors are green and white. Leading the Manhattan College Jaspers men’s soccer team is Head Coach Jorden Scott. He is now in his sixth year at the helm of the Manhattan Jaspers men’s soccer program. Coach Jarden Scott is a bachelor’s degree in sports psychology graduate from the University of Glamorgan. Currently, he is completing his master’s degree in physical and special education at Montclair State University. Coach Scott is a Union of European Football Associations “B” coaching license holder. Ultimately, Coach Jorden Scott is the 2013 Metro Atlantic Athletic Conference (MAAC) Coach Of The Year. Then, the Manhattan College Jaspers men’s soccer assistant coaches are Edison Sanchez and Sean Reilly. Coach Edison Sanchez is in his first season with the coaching staff. He is a Monroe College graduate and the college’s former head women’s soccer coach. He was an important part of the Mustang two National Championships berths. Similarly, Coach Sean Reilly is also in his first season with the Jaspers’ men’s soccer coaching staff. He is a bachelor’s degree in sports management graduate from St. Thomas Aquinas College. Coach Reilly has played professional soccer for the Rochester Rhinos in the United Soccer League (USL). He also played for the Finn Harps and Institute FC. 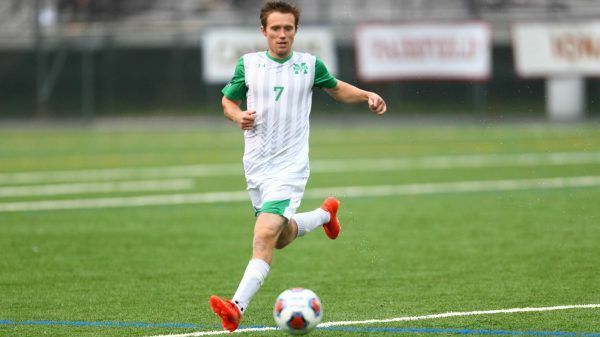 The Manhattan College Jaspers Men's Soccer Summer ID Camp will provide a first-hand NCAA level training experience to players who are aspiring to become an elite college soccer athlete. This program is a single-day event that will run from 12:00 PM until 5:00 PM on the 4th of August. Its venue is the beautiful Manhattan College campus.